Parents have long faced the dilemma of when to step back and when to take a more hands-on approach with their kids. Technology has added a new wrinkle to that problem: Today’s parents must navigate how, when and to what extent they oversee their teens’ online and mobile activities. A new Pew Research Center report on parents of 13- to 17-year-olds finds that parents take a wide range of actions to monitor their teen’s digital life and to encourage their child to use technology in an appropriate and responsible manner. 1 Parents are keeping a close eye on their teen’s digital life, but few do so by tech-based means. Roughly six-in-ten parents say they have either checked which websites their teen has visited or looked at their teen’s social media profile. And about half say they have looked through their teen’s phone call records or messages. But few parents are utilizing more technical measures – such as parental controls or location tracking tools – to monitor their teen. 2A majority of parents employ “digital grounding” or restrict their teen’s online access. Sixty-five percent of parents say they have taken away their teen’s internet privileges or cellphone as punishment, while half of parents limit how often their teen can be online. Pew Research Center surveys have found that 92% of teens say they go online daily, with 24% using the internet “almost constantly,” and nearly three-quarters of teens have access to a smartphone. Therefore, “digital grounding” is a potentially potent form of discipline. But limiting online screen time isn’t always a consequence of bad behavior: 55% of parents say they limit the amount of time their teen can go online, regardless of behavior. Moreover, parents of younger teens are especially likely to place limits on their teen’s internet use. 3 Many parents know the passwords to their teen’s various accounts and devices, but knowing your teen’s log-in information is not universal. 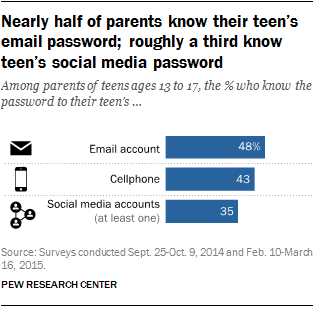 Nearly half (48%) of parents say they know the password to their teen’s email account while 43% are privy to their teen’s cellphone password. 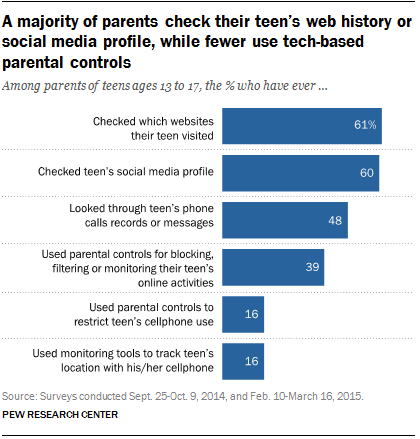 Fewer parents – 35% – say they know the password to at least one of their teen’s social media accounts. 4Some parents take the additional step of friending or following their teen on social media. Some 44% of parents are friends with their teen on Facebook, while one-in-ten report following their teen on Twitter. In total, 56% of parents are connected with their teen on Facebook, Twitter or some other social media platform. 5Nearly all parents have talked with their teen about how to behave on the web, including more than nine-in ten who have discussed what is appropriate to share online (94%), what constitutes appropriate online behavior towards others (92%) and what is appropriate content for teens to view online (95%). 6 Whether or not parents frequently discuss acceptable conduct with their teen varies by a number of demographic characteristics. For example, mothers are more likely than fathers to report talking frequently with their teen about appropriate online and offline behavior. There are also differences based on household income. Across the five types of conversations measured, parents who are less affluent are more likely than those from higher-income households to have these regular conversations. And Hispanic parents (51%) are more likely than white (32%) or black (32%) parents to frequently speak with their teen about their online behavior towards others.